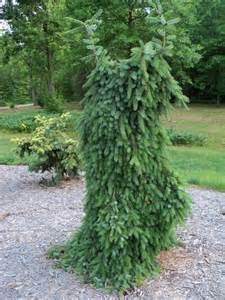 Weeping Serbian Spruce is a unique evergreen tree that will fit in a tight area as it will only grow to a full width of 6' and about 30' tall when mature. It has a graceful weeping habit that will make a great specimen planting. You can plant this is a Rock Garden but allow it some room. The needles are a dark green color with silver underside. The new growth in the spring is a light green and darkens as the season progresses. Plant Weeping Serbian Spruce in full sun. It is drought tolerant once it is established and deer tend to stay away.